• WALK-IN LEVEL. NO STAIRS. THIRD FLOOR. •	PERFECT GET-AWAY RETREAT. NEWLY RENOVATED! •	Spacious 1300 sq ft all on one level! Beautifully Furnished! •	Private Covered Balcony 80 ft from Table Rock Lake! •	Two King-Size Master Suites! Jacuzzi Tubs! •	Open Concept Great Room, Kitchen and Dining Space. •	Fully Equipped Kitchen. Wet Bar. Washer & Dryer. •	Two Swimming Pools--one Olympic size! Hot Tub! •	Table Rock Lake Swim Beach and Fishing Area! •	Full Service Marina, Boat Rentals and Slips. Enjoy your spacious upscale condo 80 ft from Table Rock Lake, in the Beautiful Mark Twain National Forest! Just far enough away from the neon lights and traffic, yet close enough to enjoy all the fun! Beautifully Decorated, Flat Screen TV in every room, DISH satellite, DVD Player, Movies, CD player. WI-FI is available for a nominal fee. Fully equipped kitchen. Refrigerator, stove, dishwasher, microwave, ice-maker, coffee pot, toaster, blender, ample cookware and dishes. Full size washer and dryer, ironing board and iron, and hair dryers in each bath. All linens, sheets and towels are provided. Many extras provided not found in agency-managed properties. Guests say it feels like staying at the home of good friends rather than a rental! Within our stunning 150 acre wooded resort, a short walk from your condo, you will find a Table Rock Lake beach! Included FREE with your rental are two swimming pools (one is Olympic size), a hot tub, a boat launch, boat trailer parking, hiking trails, mini-golf, tennis, shuffleboard, basketball, volleyball, archery, playground, children's pool, activity center with games, movies, and cafe. Canoes, rowboats & paddle boats are available to rent for $6/hr. Kayaks $11/hr. A remote secluded setting, yet just 5 minutes from Kimberling City where you'll find grocery stores, restaurants, medical clinic, post office, and the largest marina on Table Rock Lake where you may rent a pontoon boat, speed boat, fishing boat, waverunners, or a covered slip for your own boat! 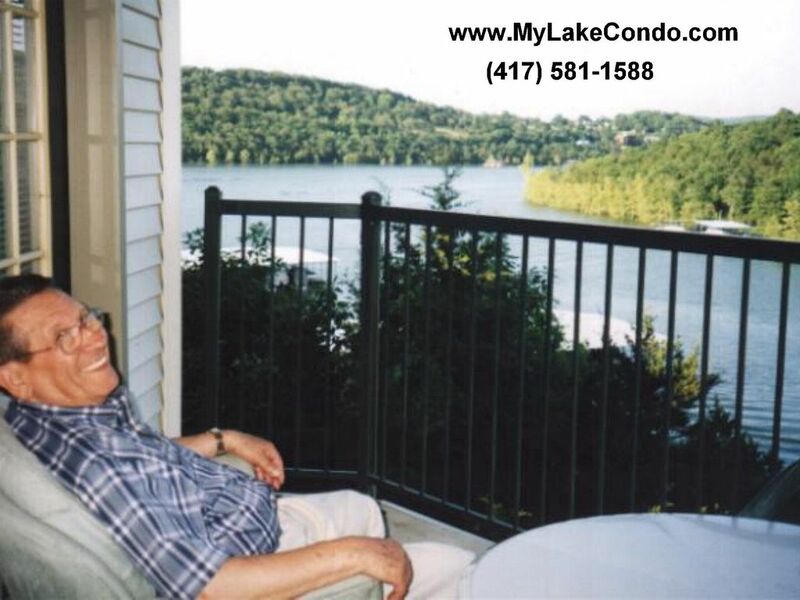 Thank you for your interest in our fabulous lakefront condos! Our condo and resort are the perfect place for your vacation. It is in a secluded quiet resort right on the lake. Most owners do not rent their units. Only a few rent when they're not using it themselves, which makes this a particularly nice place to stay! It's never crowded. Always peaceful and beautiful. Kick back and relax, check out a kayak or canoe and observe nature on a glassy lake in complete silence ... or go parasailing, scuba diving, horseback riding, or ziplining!! Silver Dollar City Theme Park is just minutes away. In neighboring Branson, ride Go-Carts, the amazing Ferris wheel, play Golf, visit the Titanic museum, Wax museum, or choose from dozens of live shows ... music, comedy, magic & more! FABULOUS! We had rented every condo available in Branson and on the lake before we came upon this property and it is the best by far for many reasons. The condo is much larger than any we'd ever seen, has a unique split bedroom floor plan, two king size master bedroom suites, two full baths, large kitchen, open great room and private covered balcony 80 ft from Table Rock Lake. Our condos are fully furnished and equipped. Our guests are delighted at the many extras we provide, and often comment that it feels like home! A sidewalk leads from your front door right down to the lake. The lake is ideal for swimming, boating and fishing. Our 52,000 acre lake is spectacular, warm and clear! The 800 mile shoreline is virtually unspoiled, and if you choose to rent a pontoon boat one day and explore, it just may be the best day of your vacation! It is our great pleasure to welcome you as our guests! Meet your hosts Darrel & Bobbie, professional interior designers. Our guests appreciate the custom touches found in our property. We enjoy sharing our beautiful vacation home on Table Rock Lake near Branson Missouri. We vacationed here on Table Rock Lake for years and rented every property around, all the while searching for our own perfect vacation home. We stayed in condos that were too old, too small, in noisy crowded resorts, not well equipped and in very remote locations. We stayed at places with a lake view, but none had lake access! We found ourselves hiking through woods and crawling over rocks to actually swim in this beautiful, warm, clear lake! FINALLY we discovered this gorgeous lakefront, lakeview condo with a sidewalk leading from the front door right to an actual swim beach! HEAVEN! The condo itself was INCOMPARABLE to anything we'd ever seen. Much larger, much brighter, and great split bedroom floor plan! The location is perfect. It is in the center of this 52,000 acre lake, set in a 150 acre secluded mountain resort. Away from the hustle. Yet just over the bridge is the entire town of Kimberling City with everything we ever need. A PERFECT LOCATION in a very beautiful setting. After years of searching we found the perfect vacation home! Our private luxury vacation condo is very unique because it is located within a 150 acre wooded resort with loads of amenities not normally found at a typical condo rental complex. Our privately owned condo, which is located right on the lake, shares the resort with RCI timeshare cabins, which are up the hill, and that is why there are TWO beautiful swimming pools, mini-golf, canoes, rowboats, paddle boats, archery, shuffleboard, tennis, basketball, volleyball, a beach, a boat launch, boat trailer parking, and an activity center with games, movies and food. Our condo and resort, unlike many others which are far from civilization, is only minutes from grocery stores, restaurants, and the largest marina on Table Rock Lake where we can rent boats and boat slips. Full Bath. Combination Jacuzzi Tub & Shower. Walk out your front door right down the sidewalk to our Table Rock Lake swim beach! A rare find on this beautiful 52,000 acre lake! Relax on your balcony just 80 ft from Table Rock Lake! Peaceful seclusion. Hear only the sounds of nature! Fabulous getaway retreat! Beautiful Ozark Mountains surround you. All Bed Linens Are Provided. Full Size Stacked Washer & Dryer Inside The Condo. Free parking available at entrance to building. Secure Boat Trailer Parking Available Close to Condo. Must Hang Boat Trailer Tag Found Inside the Condo. Wi-Fi is available in this condo upon request. $5/day or $20/wk. Free Wi-Fi is available at the Activity Outpost within the resort. Bath Towels Are Provided. Please Bring Your Own Beach Towels For Pool Or Beach Use. Beautiful Open Concept Great Room. 18 cu ft Whirlpool Refrigerator/Freezer, Automatic Ice-Maker. Plenty of Dishes, Glasses, Serving Bowls. and Flatware. You Won't Have To Run The Dishwasher After Every Meal! DISH Network Satellite. Great channel line-up. Loads of Games At the Activity Outpost Within The Resort. Pool Table and Ping Pong Table at the Activity Outpost Within The Resort. Children's Toys Available At the Activity Outpost Within The Resort. Some DVD's are located inside the condo. Additional DVD's are available to rent at the ACTIVITY OUTPOST within the resort. Video games are available at the ACTIVITY OUTPOST within the resort. Big Screen TV and Movies. Private Covered Balcony With Table and Chairs and Gas Grill. Canoes, Rowboats and Paddle Boats Available For Rent On Property, $6.50/hr. New! Kayaks $11/hr. Largest Marina On Table Rock Lake is 5 Minutes Away. Rent Pontoon Boats, Speed Boats, WaveRunners, or a Boat Slip For Your Own Boat. Tennis Court on Property. FREE Equipment Provided With Pool Pass. Mini-Golf On Property. FREE Equipment Provided With Pool Pass. 8 Championship Golf Courses In The Area. See Website for Details. Very nice area, Fantastic view!!! Older appliances and mattresses and the pull out couch was not the most comfortable but still a great place! We were able to stay there with small children, cook large meals in the kitchen, and have a great time! Great layout and loved the privacy that we could have with all the doors for when some went to bed but others wanted to stay up. Guests appreciate the excellent floor plan and spaciousness of our lakefront condo. Stunning resort setting. The kitchen is larger than most and outfitted with everything needed to prepare meals which makes our property a great choice for holidays and Thanksgiving. Another great review from satisfied guests! Reserve your dates now! You will love My Lake Condo on Table Rock Lake! Two couples enjoyed a beautiful condo. We very much enjoyed our stay at this fine condo. The property exceeded our expectations and was more comfortable than any place we’ve ever stayed. Very spacious, excellent layout, comfortable beds, plenty of pillow choices, lovely furnishings. We felt like the owners really care about their guests by the attention given to detail. The lakeside balcony was our favorite place to sit and enjoy nature in a peaceful beautiful setting. It is furnished with a nice table, chairs and small propane grill. We learned the property has been recently renovated inside and out and it is evident. Everything is in excellent condition. Our group consisted of two adult couples and the condo suited us very well with two separate master bedrooms both with king size beds, sitting areas, and private ensuite bath. These were on opposite sides of an open great room/dining area/kitchen. Very unusual with angled walls. Smart floor plan. The complex is in a remote wooded resort, but not far from groceries, restaurants, Silver Dollar City. It is a short walk to the lake and paved all the way. We enjoyed renting kayaks and free mini-golf and tennis. There are many nice things included that we’ve not seen at any other condo rental. Based on all this and more, we give this condo a high five star recommendation. We genuinely do care about our guests comfort and strive to provide the best possible vacation rental! The great majority of our guests are well satisfied and many choose to return. Our guest book at the condo is filled with rave reviews. We look forward to welcoming you next! Really enjoyed the detailed information provided by the owner. Everything important was described perfectly and there were reminders posted at the condo. Also appreciated that there was parking provided for our boat trailer which was not provided by other condos we have stayed at. Appreciated the color palette of the condo but the flowered sofas and jacuzzi area looked rather dated. The mattress was too hard and uncomfortable (especially since we stayed for several days). Also, the mattress sloped acutely toward the headboard and resulted in having a crooked neck each morning.There were several (5) fake plants on the kitchen counter and other sites about the rooms. One or two in the kitchen would have sufficed. The noise factor was unpleasant since you could hear the people above you stomping around at all hours. It wasn't too bad until a family with a bunch of kids moved in a couple days after we got there and they were very energetic to say the least. The floors of the rooms were not level and was very noticeable when walking thru the rooms. One of our favorite things to do at Table Rock is to sit on the balcony and enjoy the water view. The picture on line showed a lovely view of the water from the balcony but when we went out there, the trees obstructed most of the view. Idea to add in your instructions to future renters: The tap water in the area has an odd taste. You may want to bring bottled water to drink but it does not affect the taste of brewed coffee. Our guest enjoyed the July 4th week at our beautiful walk-in level lakefront condo on fabulous Table Rock Lake. Included with your stay is free access to a nice concrete boat launch and free secure boat trailer parking, not to mention our lake beach, kayaks, canoes and paddleboats for guests without a boat. These amenities are just a few of the many extras not found elsewhere. We pride ourselves on detailed access information provided to all guests. The condo owners are always just a friendly phone call away to answer any additional questions. Thanks to added memory foam and many pillow choices, guests rave about our comfortable beds and how they sleep well at our condo on the lake. Guests also enjoy the peace and serenity. Most of the time there is no one else in the building due to the fact that most units are not rented and owners seldom come down. As owners/interior designers who care for our own property, we receive many compliments on our delightful décor, child-friendly unbreakable accessories, and many compliments on cleanliness, unlike most agency managed condos which are bland and not nearly as well maintained. Unlike most rental condos, our guests also enjoy a well supplied kitchen with more than adequate dishes and cookware, ample towels, washer and dryer with laundry soap, as well as all the unexpected thoughtful extras provided such as seasonings, tissue, paper towels, band-aids, combs, toothbrushes, etc, etc. Most often heard comment is that our condo "felt like home". Table Rock Lake is the most beautiful lake in the country, clear and warm. It is well managed by the Army Corps of Engineers who fine $10,000 per tree if touched. Nearly all lakefront properties have partially obstructed lake views for this reason. It's a bit of a trade-off because boating on this lake is spectacular with the unspoiled shoreline. With easy lake access, our condo location is perfect, unlike anywhere else we ever rented on Table Rock Lake because it is a very short walk out the front door, down a sidewalk and paved road right to the lake. Set within a stunning 150 acre wooded resort, free mini-golf, tennis, archery, shuffleboard, hiking trails, activity center, two pools, hot tub, kayaks, canoes and more fine amenities add up to make our Table Rock Lakefront condo a perfect rental choice! Excellent property. We enjoyed our stay. Comfortable condo. Nice place to relax inbetween outings to Branson. A little outdated but was very comfortable. Quiet area about a half hour drive to the strip. Located in the Mark Twain National Forest, 150 Acre Resort, Lake Swim Beach, Wooded Hiking Trails, Two Swimming Pools, (one is Olympic-size) Hot Tub, Mini-Golf, Volleyball, Basketball, Tennis, Kayaks, Canoes, Paddle Boats, Playground, Picnic Area, Indoor Activity Center with Games, Movies and Food. Fishing/Guides, Horseback Riding, Ziplining, Cave Tours, Silver Dollar City, White Water Theme Parks, Ride The Ducks, Go-Karts, Ferris Wheel. Full Service Marina, Scuba Diving, ParaSailing, SailBoats, Water-skis, Pontoon Boats, Speed Boats, Waverunners. Championship Golf Courses. Fabulous Outlet Malls, Unique Gift Shops, Craft Stores, Flea Markets, & Antique Shops. Located within 15 minutes drive of Silver Dollar City, Dogwood Canyon, Talking Rocks Caverns, and Zip-Line USA. Eureka Springs Arkansas, quirky mountainside historic town, is just 40 minutes away. Branson is the Live Entertainment Capital of the World with 50,000 Seats of Entertainment. Guests of All Ages Enjoy Wholesome Family Style Shows. FROM $140-$195/night (2-7 night minimum) Sat to Sat during peak summer season. Multiple units available. Shorter stays may be available. Check-in 4:00PM & Check-out 10:00AM Sorry - NO Smoking, NO Pets. 50% Deposit To Reserve - Balance 30 days Prior to Arrival $75 cleaning fee. 6% tax. We accept MasterCard, Visa, Discover, American Express and Personal Checks.